The oceans’ floors are not a flat, sandy expanse – they are every bit as varied as the landscapes above water, with plunging valleys and huge mountains. Making a map of them has been a challenging task. The $7 Million Shell Ocean Discovery XPRIZE is a global, three-year competition challenging teams to advance breakthrough technologies for rapid, unmanned and high-resolution ocean exploration. The $1M NOAA bonus prize will be awarded to teams that demonstrate their technology can “sniff out” a specified object in the ocean through biological and chemical signals. This will allow us to respond to emergencies, and discover new marine life and underwater communities in a way that never existed before. The sea’s terrain plays a critical role in our ecosystem. Underwater crests and valleys determine weather patterns and ocean currents; sea topography influences the management of fisheries that feed millions; miles of underwater cable connect billions more to the Internet; seamounts provide protection against coastal hazards such as approaching hurricanes or tsunamis, and may even offer clues to the prehistoric movement of the earth’s southern continents. But the underwater discoveries that await aren’t only of interest to mapmakers or marine researchers. Far below the ocean’s surface lies buried treasure: precious metals, rare earth elements, oil and diamonds – riches that have, until now, remained inaccessible to even the most intrepid of prospectors. Some ecologists fear that a map of our sea floor will allow extractive industries the chance to profit from these resources, potentially endangering marine habitats and coastal communities in the process. 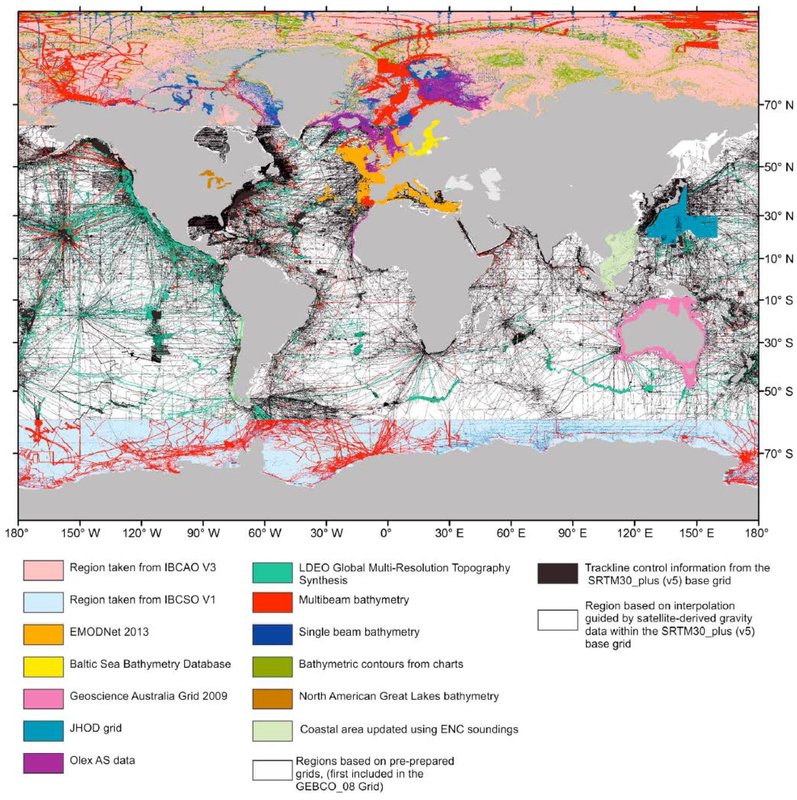 A global bathymetric map – that is, a map of the ocean’s floor – would certainly offer a better understanding of our blue planet, but it also might plunge us into a realm once reserved for science fiction: robot submarines, underwater volcanoes, sea jewels, coral with pharmaceutical properties, Wild West maritime law, toxic sediment plumes, and an ocean-based enterprise curiously devoid of humans or ships. Once the map is made, will it be used as a tool for responsible management and conservation, or wielded like pirate’s bounty, a guidebook to extraction and exploitation? Note : at this scale, the World Ocean appears much better covered with ship soundings than it is. Only 15% of the Earth’s ocean is mapped. Zoom in on the middle of the Pacific in Google Earth, for example, and you’ll find a representation of the ocean floor based on satellite and gravity-derived bathymetry: low resolution, indirect, often inaccurate. Considering that we’ve plotted our Solar System and charted the human genome, it’s rather astonishing that no map of the seafloor exists. But the reason is simple: our planet’s oceans are vast, deep, and largely impenetrable, and water literally gets in the way. For centuries, charting the murky depths meant braving the high seas, dangling plumb lines over the side of a ship, then drawing basic contours on cartographic maps. Sailors etched soundings onto maps as early as the 16th Century, but no international standards for terminology or scale existed then, meaning early maps were not only rudimentary wayfaring tools, they were also confusing and contradictory. It wasn’t until the turn of the 20th Century, an era marked by soaring interest in the natural world, that a group of geographers gathered under the leadership of Prince Albert I of Monaco to produce the first international charts of the ocean (what would eventually become Gebco). Albert was fascinated by the then relatively new science of oceanography, and commissioned four research yachts to survey the Mediterranean. More than 100 years later, Gebco and the Nippon Foundation formally announced Seabed 2030, a project that aims to map the entire sea floor by the year 2030 using data gathered from vessels around the world – including soundings from those early expeditions. Modern ships like the kind used in Seabed 2030 are now outfitted with multibeam bathymetry, sonar systems that emit sound waves in a fan shape beneath a ship’s hull. Each sonar ping measures the time it takes for a signal to reach the seafloor and return to the surface, a calculation of the water’s depth that can be marked as a coordinate on a grid. “Multibeam extends the map area and gives us extended coverage,” explains Vicki Ferrini, the chair of Gebco’s subcommittee for undersea mapping. Most ships already rely on sonar for obstacle avoidance and navigation, but vessels with multibeam dramatically increase the area of seafloor that researchers can ensonify – that is, the underwater footprint or track line they can capture with sonar. Part of the problem, however, is that ocean track lines are a lot like highways: certain parts of our oceans are heavily trafficked, while others may have no roads at all. Continent-sized swathes of our planet’s seas are not regularly plied by ships. One ship’s crossing between Hawaii and Japan, for instance, offers valuable track line data, but planned missions to more remote waters are equally important. “A bathymetric survey done with modern multibeam is more than just driving a ship around the ocean,” says Rear Admiral Shepard Smith, director of the United States Office of Coast Survey at the National Oceanic and Atmospheric Administration (NOAA), a contributor to Seabed 2030. “Sonar data is valuable, however; particularly in areas where we don’t have anything,” he says. Gebco hopes to mitigate this problem by encouraging cargo ships, fishing boats and pleasure craft to participate in the project and transmit their data in real time, effectively crowdsourcing the underwater map. The organisation also offers a “cook book”: a technical reference manual on building bathymetric grids, which can help developing nations make use of shared expertise. Marine enthusiasts are even invited to submit name proposals for various underwater features – knolls, aprons, ridges, reefs, calderas, trenches, saddles, sills and salt domes, to name a few – by sending a letter to the International Hydrographic Organisation in Monaco. 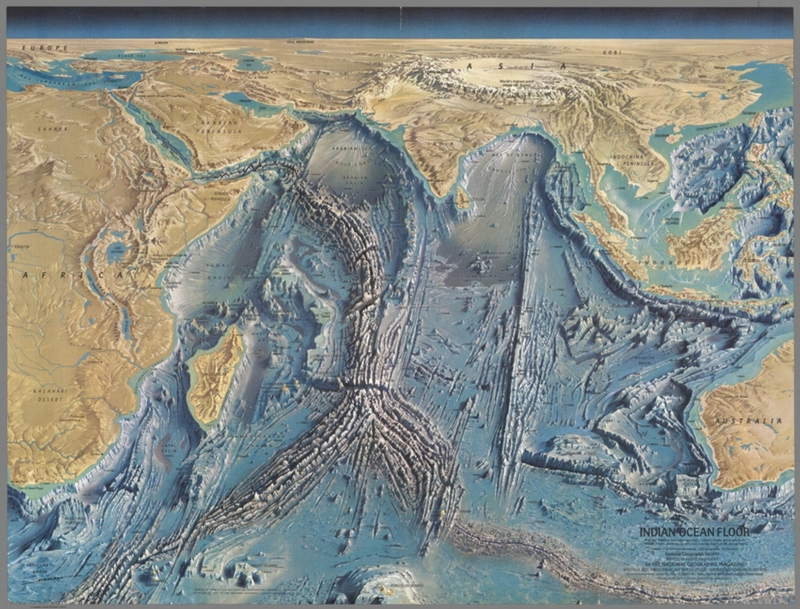 The actual map is assembled at the British Oceanographic Data Centre in the UK. Helen Snaith, the Global Centre lead for SeaBed2030, notes that “everyone from ocean modellers and researchers to policy makers and the general public can access the current data” via a marine iOS app. Perhaps no single modern expedition reveals the complexity of deep-sea ocean mapping more strikingly than the search for the missing Malaysian Airlines Flight 370 (MH370). Investigators suspected that the plane, which vanished in 2014 en-route to Kuala Lumpur, had crashed in a remote area of the Indian Ocean. The area was so poorly mapped, however, that search teams had to do basic mapping of the search area before they could draw up a more precise map with enough resolution to spot wreckage. 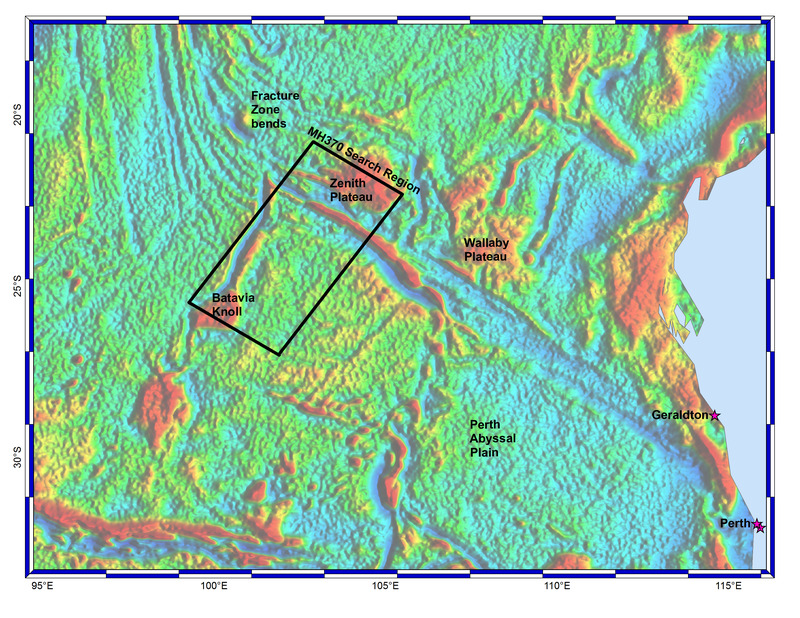 In fact, the search area was too deep to explore with ship-based mapping. In shallower water, sonar-equipped towboats trail behind a manned vessel, but the Indian Ocean’s depth, monsoon climate and powerful currents made navigation of towed vehicles nearly impossible; instead, investigators dispatched a fleet of autonomous underwater vehicles, or AUVs. Though underwater robotics is in its infancy, deep sea surveys have come to rely increasingly on submarines to scour the seabed for more detailed mapping. “There are many advantages to AUVs,” explains James Bellingham, director of the Woods Hole Center for Marine Robotics in Massachusetts, USA. “They are faster, they provide higher-resolution seafloor surveys, including hazard assessment, they lower upfront capital costs, and provide increased access to the ocean.” A proper multi-beam bathymetry system costs several million dollars and requires trained operators to sort the data, because ships, by definition, float on the ocean’s surface – not below it. An AUV, by contrast, is less expensive and ideally suited to lonely, open stretches of water: researchers are currently designing new models that can be launched from land, and need to be powered only by batteries. Of course, these assets can quickly turn into hazards: batteries need to be recharged, navigation systems must be tracked from nearby ships, and an AUV that breaks down must be brought back to port for service. “In the future,” says Bellingham, “an autonomous surface vehicle might tow out underwater vehicles,” thus eliminating human beings from the at-sea aspects of mapping altogether. October, 1967 Based on bathymetric studies by Bruce C. Heezen and Marie Tharp of the Lamont Geological Observatory. The Indian Ocean is known in ancient Sanskrit as Ratnakara, “the mine of gems”. The name is indeed prophetic: hidden in the subsea mountains and valleys of that remote ocean are vast pools of resources, including rare metal alloys, oil, hydrothermal vents, even diamonds. These aquatic riches are already on commercial radar, and a handful of ocean prospectors have begun to make their own high-resolution maps of the sea floor. That data can be of value to researchers, Ferrini explains: oil, mineral and seismic companies might elect to contribute decimated, or lower resolution data, to Gebco’s map, thereby protecting their commercial interests while adding important information to the 2030 project. Consider that De Beers Group, an international corporation and household name in diamond mining and retail, formed a partnership with the Namibian government over 20 years ago in pursuit of diamonds off the coast of that mineral-rich country. More recently, De Beers added to its naval fleet several AUVs – part of a drill and crawler mining system that can scour the surface of the seafloor, loosen deep seabed sediment for rough diamonds and haul their cache hundreds of metres to the surface. While shallow-water mining for sand, gold, tin, and diamonds is a decades-old enterprise, commercial deep sea mining is a new industry, its environmental impact yet unknown. Scientists predict habitat degradation, slow and uncertain recovery, toxic plumes from surface ore, undersea noise, chemical spills in transport, and species extinctions. Still, the industry’s economic incentives often outweigh environmental safety concerns. Rare earth metals found in deep sea alloys are used in everything from cell phones and DVDs to rechargeable batteries, magnets, computer memory and fluorescent lighting; and terrestrial oil reserves are being swiftly depleted, making the switch to deep sea wells an ever more tempting prospect. “This is a race,” explains Bellingham. “A race to get a baseline understanding of our ocean, before we change it dramatically. Aside from the obvious effects of climate change, many of our shared waters have also become prey to urban ocean: seafloors riddled with pipelines, router cables and aquaculture, a trend that suggests we are all too eager to exploit our oceans before we properly understand them. Map or no map, international maritime laws currently restrict deep sea mining more than 200 miles offshore – the point at which countries no longer have jurisdiction over their waters. 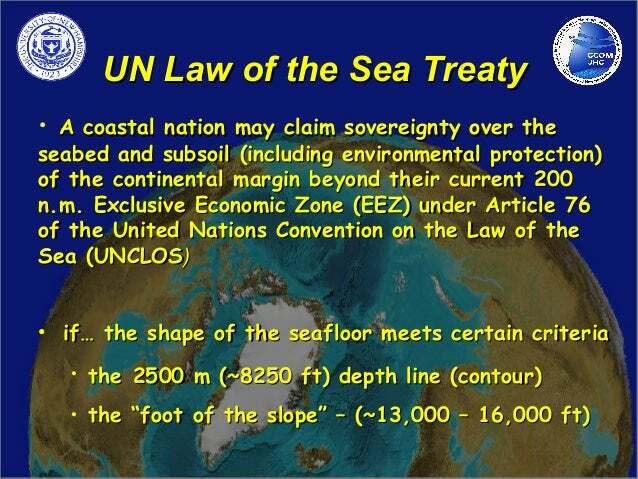 The United Nations Convention for the Law of the Sea is the legal framework that sets out the rights and duties of States in the use and exploitation of the oceans. Article 76 of the convention repeatedly refers to the “continental margin,” the boundary between crustal provinces (that is, the physical outer edge of a country’s land) and the deep ocean basins beyond them; the law states that deep-sea life must be protected, and that revenue made from any mining venture there must be shared with the international community. The deep ocean constitutes the largest and least understood biological habitat on Earth. Two-thirds of our planet contains a marine wonderland of beauty and mystery. These regions, characterized by extreme pressure, cold temperatures, and near-constant darkness are nonetheless home to an astonishingly diverse menagerie of creatures – the Dumbo octopus, the vampire squid, the ghost shark, spider crabs, coral and electric eels – bizarre organisms that display striking evolutionary adaptations. Though these underwater denizens have changed little since the time of the dinosaurs, they are not terribly resilient, being slow to reproduce and highly sensitive to disturbance. An international underwater atlas requires cooperation between stakeholders with various, sometimes competing interests, from government officials and oceanographers to military submarine operators, fishermen and offshore miners. Once detailed bathymetric information is made available to the public, protective measures must be taken to protect both the map and the landscape it describes. “A high-resolution map is an investment in responsible management of the seabed in the coming centuries,” says Rear Admiral Smith. Indeed, we have but one planetary ocean, and its preservation depends on conscientious stewardship – particularly as we turn to its depths for the resources we can no longer find on dry land. An underwater map might be the very sea change we need. Newsweek : Mission Deep Sea, why map Mars before the Ocean ?